After nearly turning her back on the game, senior Sydney Wilhem is now consumed by volleyball success. Sydney Wilhelm stepped off the volleyball court at the club team national tournament last April ready to transition into the next stage of her life -- one without volleyball. She had decided that the game she loved would no longer be a dominant part of her life. A month later the then-senior-to-be received a call from Texas A&M assistant volleyball coach Steve Greene, asking her if she would be interested in joining the team. "I thought I was done with volleyball because I wasn't going to play club this year either," Wilhelm said. "Without hesitation, though, I said yes because you can't pass that up when somebody asks you that." Wilhelm had been on the radar of Greene and associate head coach John Corbelli for quite some time. Her cameo appearance at the national tournament then caught the attention of A&M head coach Laurie Corbelli, who attended the event in Reno, Nevada, to watch her daughter Rachel play for Texas. "I thought, oh [Allie Freiwald] is playing for A&M. I'll go over and watch her, give them my support," Corbelli said of her former setter, who left the team for medical reasons. "Then I remembered John and Steve said the outside hitter for the club team is a really good, that she was beating the ball, and I'm watching, thinking that must be Wilhelm. I saw her. She was the standout of the points I watched." Wilhelm had asked to try out for the team before her sophomore season, but A&M had no room on its roster because it had signed a big recruiting class. "They said to come back and try next year, and I said OK," Wilhelm said. "But then I went and joined the club team and thought, all right -- there is my volleyball fix. I got it. I'll stay with this and decided to not inquire about trying out again." But the tables reversed a year later with the coaches asking Wilhelm to join the team. "I honestly thought they were joking," Wilhelm said. "[But] I'm a competitor and an athlete, and knowing I could go and play with people that are just as competitive and athletic as me, I was excited to get that opportunity." Wilhelm has taken advantage of the opportunity, playing in 19 of the Aggies' first 26 matches -- again much to her surprise. "I did think I was just going to be a practice player," Wilhelm said. "It was a little shocking the first time [Corbelli] said my name. There were a few nerves being in such a big stadium, never having played in something like that, but they went away after one or two points, and I went back to playing how I normally play." With little to lose at this point in her volleyball life, Wilhelm, the Bastrop graduate, plays with a style all her own. "She is fearless," Corbelli said. "She has always been a starter on every team she's been on. She's been a leader, a go-to hitter. She's handled a lot of situations and maybe it wasn't a Division I championship match but it was an important match to her, and she's been in that situation of you can't be afraid." Corbelli discovered Wilhelm at a club tournament. Wilhelm can't afford to be scared, as an outside hitter she is already at a disadvantage on the Division I level, where the average player at her position is somewhere in the 6-foot range. Wilhelm is listed at 5-foot-9, but readily admits in her stocking feet she's 5-foot-6. What she lacks in stature though she makes up for in athleticism and attitude. "Coming out of high school and trying to talk to colleges about going here or going there, they are, [looking at me like] do you see how tall you are, now you can't come here," Wilhelm said. "But I think I have a short person's syndrome because I think I am 6-2 and I walk around like, 'oh yeah I'm as tall as you.' I don't really recognize or let [height] get to me because I do have that outlook, that I'm just as tall as you." Wilhelm may not be 6-foot-2, but she reaches as high as many of her front-row opponents, which has helped her post 41 kills and 11 blocks overall. Although those are modest numbers for a season, Wilhelm has been invaluable to Corbelli as a player to jump-start her team when things are not going well. "I'd say her biggest asset for us is she can go in on the left side and beat the ball," Corbelli said. "That's what has been so nice. She also can pass and loves to play defense and run balls down." 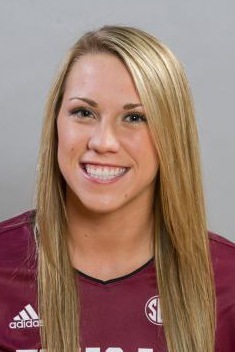 On three occasions she has led the team in digs, and has 75 for the season, with a high of 17 against Corpus Christi. As the only senior on the team, Wilhelm will be moving on with her life soon. Sunday against Missouri is her last match at Reed Arena. "I'm so thankful for the opportunity but so disappointed that I have to leave so early because all the girls I've met are so awesome," Wilhelm said. "I love going to practice with them and going to games, getting to travel with them and I'm going to miss all that incredibly. The fact that I got to do it at all though is what I'll remember from it."